It is no big secret that roofers are an often mistrusted group of individuals, somewhere akin to used car salesmen. Everyone has heard at least on story about a roofing contractor that ends up exhorting a customer for more money once they start the job or even worse, walking away from a project half way through. Contractors are notorious for doing sub par work repeatedly and even stealing peoples down payment outright without doing a thing. Therefore, it is time we as an industry take some responsibility and are proactive in thinking about new ways we can regain our customers trust. In today’s day and age, information is everywhere and there is absolutely nothing left that cant be found somewhere online. The car industry has been revolutionized by this movement as people are now able to shop for ours on end looking for the best deal before they step foot into a dealership, industry leaders such as Autotrader leading the race here. There are all sorts of articles and websites specifically designed to help the customer negotiation the best deal possible. Review sights rate both the facilities and employees so that you know exactly what you are getting into and can prepare your battle plan up front. The home improvement industry is still holding fast to the old school, wild west mentality where pricing is made up on the fly and salesman just try to get as much as they can for every job. I am amazed how many times we run into situations in which out customers have been just violated by our competition, spending hours on end listening to their pitch and suffering endless “discounts” to try and get them to sign the deal on the spot. I am here today to tell you that those days are almost over. Review sites, such as Angies List, alone have helped stop some of these predatory practices. It is still surprising that anyone falls for it at all, but I guess if it wasn’t effective no one would be using the hard sell. Everyone needs to now stick to their word and honor the contract to the best of their abilities. Back in the day it was rare for customers to actually here from each other regarding a roofing contractor unless they were very close personal friends. Even then, no matter how much they bitched and moaned, there are only a certain number of people that would hear you and it is most likely at a time when they honestly could care less. Now, customers are able to go online and here from everybody that has used the roofing company to see exactly what they are saying about them. That, and it is done instantly and conveniently, when it is of importance to you! That brings us full circle back to the advent of these new technologies utilized by professional in the roofing industry. Yes, satellite imagery has been around for a while. However, it is not something widely adopted as of yet. Not that this is the end all be all answer to our woes, but it is just another piece to the puzzle. The roofing industry is moving forward and every new piece of technology that helps alleviate customer concerns while helping contractors better do their jobs is a blessing. 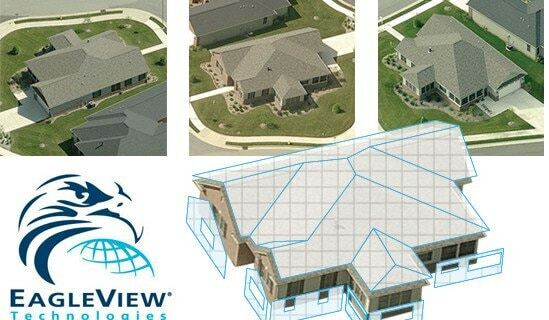 All a customer need do is download Google Earth, read a simple article on how to measure a roof, and they can known exactly how much material should be needed to complete their project. This lets them know if they are being charged a fair price per square, or if the contractor is even capable of measuring the property correctly! This is the bare minimum that we recommend to any homeowner that is still cautious about hiring a roofer in Michigan. Feel free to take it further and start doing some net free air flow calculations to ensure you are getting the right ventilation. Personally, we feel that the more educated a customer the easier our jobs are.